Next Tech Data World App – What’s inside? S1000D and XML – One of the biggest issues we face in technical communication is we are having to educate some of our engineers on the basics of XML, the why, the when and the how. Often there is confusion around what we use XML for, the power and flexibility it gives us in all forms of technical data production, transformation and deployment. As our product experts, it is important engineers know the fundamentals of XML – that is why we developed this course! 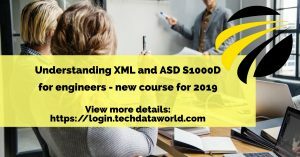 We are often asked to host workshops and training sessions to help organisations understand both XML and S1000D – so we have now formalised a course that we will schedule for 2019 – already our first course is taking bookings. What are the main components of a structured language implementation? How have specifications used structured languages to develop a technical publications delivery? Create your FREE TDW account on our website to learn more about the course including costs – TDW Member companies receive 50% discount per delegate – limited spaces are available and these spaces expire 31st Jan 2019. Anyone who wants to understand XML and specifications.